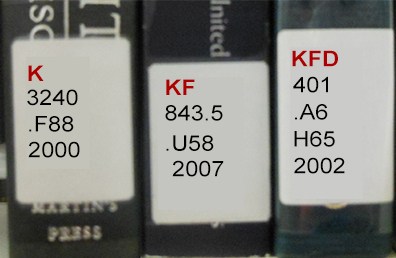 Most items in Ekstrom Library, the Art Library and the Music Library are arranged according to the Library of Congress Classification Scheme. 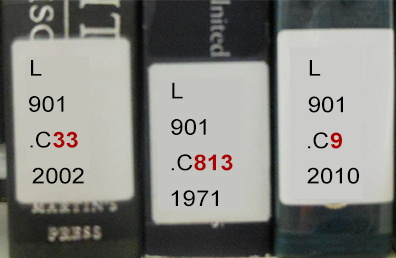 This classification scheme arranges works by subject so the call number of an item gives an indication of the subject matter of the work in addition to telling where specifically the item can be found on the shelf. 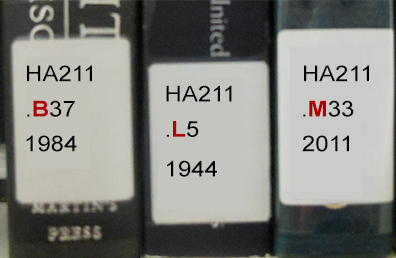 Call numbers are on (or near) the spine of the book.The call number is made up of a combination of numbers and letters that are read left-to-right, top-to-bottom. First letters: one, two or three letters that are arranged alphabetically. So K comes before KF which comes before KFD. First numbers: the first set of numbers are read as whole numbers. So K5 precedes K23 which precedes K452 which precedes K1298. Second letters: are preceded by a decimal point and are arranged alphabetically. So .B comes before .L which comes before .M. Second numbers: are treated as decimals. So .33 comes before .813 which comes before .9. There may be another letter number combo. If there is these numbers will be read as decimals as well. Year: If there is a string of four digits at the end of the call number it usually signifies the year and should be read as a whole number.